For George Papandreou's namesake grandfather, see Georgios Papandreou. George Andreas Papandreou (Greek: Γεώργιος Ανδρέας Παπανδρέου, pronounced [ʝeˈorʝios papanˈðreu], shortened to Giorgos (Γιώργος) [ˈʝorɣos]; born 16 June 1952) is a Greek American politician who served as Prime Minister of Greece from 2009 to 2011. Belonging to a political dynasty of long standing, he served under his father, then-prime minister Andreas Papandreou as Minister for National Education and Religious Affairs (1988–1989 and 1994–1996) and Minister for Foreign Affairs from 1999 to 2004. Papandreou was leader of the Panhellenic Socialist Movement (PASOK) party from February 2004 until March 2012, and President of the Socialist International since January 2006. On 6 October 2009, George Papandreou became the 182nd Prime Minister of Greece. He was the third member of the Papandreou family to serve as the country's prime minister, following his father Andreas and his grandfather Georgios Papandreou. He resigned on 11 November 2011 during the Greek government debt crisis to make way for a national unity government. Papandreou was born 16 June 1952 in Saint Paul, Minnesota, United States, where his father, Andreas Papandreou, at that time held a professorship at the University of Minnesota. His mother is American-born Margaret, née Chant. He received his secondary education at schools in Illinois in the United States, in Sweden, and graduated from King City Secondary School (near Toronto) in Canada in 1970. He attended Amherst College in Massachusetts (where he was a friend and dormitory roommate of future political rival and prime minister of Greece himself, Antonis Samaras), Stockholm University, the London School of Economics and Harvard University. He has a bachelor of arts degree in sociology from Amherst (1975) and a master's degree in sociology from the LSE (1977). He was a researcher on immigration issues at Stockholm University in 1972–73. He was also a fellow of the Foreign Relations Center of Harvard University in 1992–93. In 2002 he was awarded an honorary doctorate of laws by Amherst College and in 2006 he was named distinguished professor in the Center for Hellenic Studies by Georgia State College of Arts and Science. Papandreou's father studied and worked as professor of economics from 1939 to 1959. His paternal grandfather, Georgios Papandreou, was a three-time prime minister of Greece. The younger George Papandreou came to Greece after the restoration of Greek democracy in 1974. He then became active in the political party his father had founded, the Panhellenic Socialist Movement (PASOK). He joined the Central Committee of PASOK in 1984. Papandreou was elected to the Greek Parliament in 1981, the year his father became Prime Minister, as MP for the constituency of Achaea. He became Under Secretary for Cultural Affairs in 1985, Minister of Education and Religious Affairs in 1988, Deputy Minister of Foreign Affairs in 1993, Minister for Education and Religious Affairs again in 1994, Deputy Minister of Foreign Affairs again in 1996 and Minister of Foreign Affairs in February 1999. He was also Minister Responsible for Government Coordination for the Bid for 2004 Olympic Games in 1997. In his second term as Minister of Education, Papandreou was the first politician in Greece to introduce affirmative action, allocating 5% of university posts for the Muslim minority in Thrace. He was also instrumental in initiating the Open University in Greece. Papandreou received numerous awards and honorary degrees in recognition of his work for human rights. As Foreign Minister he fostered closer relations with Turkey and Albania. He worked to solve the dispute over Cyprus. Papandreou also worked to resolve tensions regarding the Macedonia naming dispute. Papandreou stated in 1999 that he supported Turkey's application to join the European Union. In December 2003 European Voice shortlisted him for nomination of the Europeans of the Year award as "Diplomat of the Year", naming him as "The Bridge-Builder" and quoting Le Monde that dubbed him the "architect of Greek-Turkish rapprochement". He is a founding member of the Helsinki Citizens Assembly. In anticipation of the 2004 national elections in Greece, polls indicated that PASOK was very likely to lose as the conservative New Democracy party was heading towards a landslide. In January 2004, the incumbent PM Costas Simitis announced his resignation as leader of PASOK, and passed the leadership to Papandreou by recommending him as the new leader. On 8 February 2004 PASOK introduced for the first time the procedure of open primaries for the election of party leadership. Even if Papandreou had no opponent, this was a move designed to solidify the open primaries, democratize the party, and make a clean break with the tradition of "dynastic politics." In May 2005, Papandreou was elected Vice President of the Socialist International following a proposal by the former President, António Guterres. In January 2006, Papandreou was unanimously elected President of the Socialist International. In the 2007 general election, PASOK again lost to the incumbent New Democracy party of Kostas Karamanlis and Papandreou’s leadership was challenged by Evangelos Venizelos and Kostas Skandalidis. Papandreou, however, retained his party's leadership at a leadership election in November. In June 2009 and under his leadership, his party won the 2009 European Parliament election in Greece. Four months later, PASOK won the October 2009 general elections with 43.92% of the popular vote to ND's 33.48%, and 160 parliament seats to 91. George Papandreou takes the oath of office of the Prime Minister of Greece. The inauguration of George Papandreou as the 182nd Prime Minister of Greece took place on 6 October 2009. Upon inauguration, Papandreou's government revealed that its finances were far worse than previous announcements, with a year deficit of 12.7% of GDP, four times more than the Eurozone's limit, and a public debt of $410 billion. This announcement served only to worsen the severe crisis the Greek economy was undergoing, with an unemployment rate of 10% and the country's debt rating being lowered to BBB+, the lowest in the Eurozone. Papandreou responded by promoting austerity measures, reducing spending, increasing taxes, freezing additional taxes and hiring and introducing measures aimed at combatting rampant tax evasion and reducing the country's public sector. The announced austerity program caused a wave of nationwide strikes and has been criticised by both the EU and the eurozone nations' finance ministers as falling short of its goals. On 23 April 2010 during a visit at the island of Kastelorizo, Papandreou issued a statement to the press that he instructed Finance Minister Papakonstantinou to officially ask the EU partners to activate the support mechanism, 'an unprecedented mechanism in the history and practice of the European Union'. The support mechanism, which was put in place by the European heads of state and government and further elaborated by Euro Group ministers, is a European mechanism to which the IMF is associated with financing and it involves a comprehensive three-year economic program and financing conditions. On 23 April 2010, Dominique Strauss-Kahn, the Managing Director of the International Monetary Fund (IMF) announced that Greece made a request for a Stand-By Arrangement. Papandreou and his Finance Minister Giorgos Papakonstantinou managed to convince the IMF and EU to participate in a €110bn bailout package on 9 May 2010. Greece's sovereign debt crisis, which is considered part of the European sovereign debt crisis, is marked by massive strikes and demonstrations. In an opinion poll published on 18 May 2011, 77% of the people asked said they had no faith in Papandreou as Prime Minister in handling the Greek economic crisis. On 25 May 2011 the Real Democracy Now! movement started protesting in Athens and other major Greek cities. At the time, the peaceful protests were considered to be a sign of popular rejection of Mr. Papandreou and his government's economic policies, with as much as three quarters of the Greek population being against the policies of the Papandreou government. Among the demands of the demonstrations at Athens's central square, who claim to have been over 500,000 at one point, was the resignation of Papandreou and his government. In the early hours of 22 June, George Papandreou and his government narrowly survived a vote of confidence in the Greek parliament, with 155 of the 300 seats in parliament. His government held 152 seats. On 17 September, he cancelled a visit to the IMF building in Washington D.C and the UN Headquarters in New York City amid mounting concern over the country's debt crisis. An opinion poll by Public Issue[clarification needed] on behalf of Skai TV and Kathimerini in October 2011 showed that Papandreou's popularity had dropped considerably. Of the people asked, only 23% had a positive view of George Papandreou, while 73% had a negative opinion; ranking him lower than any other leader of a party in the Hellenic Parliament. Papandreou also ranked low on the question of who is more suitable for Prime Minister, with just 22%, as both Antonis Samaras (28%) and "neither" (47%) ranked higher than him. George Papandreou and Antonis Samaras with Karolos Papoulias, the President of Greece, on 6 November 2011 discussing the formation of a caretaker government. On 26 October 2011, the European Summit agreed to hand to the Greek government the Sixth Tranche of €8 billion bailout early in the 2012, while the private-sector banks, the holders of Greek debt, have agreed to a 50% haircut on their outstanding Greek government bonds. On 28 October 2011, during the national day parade, protesters blocked the parades, forcing the President of Greece and other officials to leave. On 31 October, Papandreou announced his government's plans to hold a referendum on the acceptance of the terms of a eurozone bailout deal. The referendum was to be held in December 2011 or January 2012. However, following the insistence of EU leaders at the G20 summit in Cannes that the referendum should be on Greece's continued membership of the eurozone, and severe criticism of such a referendum by Greek Finance Minister Venizelos and within parliament, Papandreou scrapped the plan on 3 November. On 5 November, his government only narrowly won a confidence vote in parliament and opposition leader Antonis Samaras called for immediate elections. The next day Papandreou met with opposition leaders trying to reach an agreement on the formation of an interim national unity government. However, Samaras gave in only after Papandreou agreed to step aside, allowing the EU bailout to proceed and paving the way for elections on 19 February 2012. Both the Communist Party (KKE) and the leftist SYRIZA coalition had refused Papandreou's invitation to join talks on a new unity government. In August 2012, Papandreou was re-elected President of the Socialist International at its congress in Cape Town. Within domestic politics, he however remained largely sidelined within PASOK, while still an ordinary Member of the Hellenic Parliament. On 2 January 2015, Papandreou announced his aspirations to return to high-profile domestic politics. Launching his new party Movement of Democratic Socialists to contest the 25 January 2015 parliamentary elections, he confirmed the long-expected breakup with PASOK. While his decision was fiercely criticized by PASOK officials, Papandreou referred to the extraordinary situation with the country facing important challenges amidst a highly polarized political situation. He said that under these circumstances he "needed to make a bold political choice. PASOK, the party I belonged to since my youth, and led for many years, had become assimilated into conservative practices and policies." Receiving only 2.46% of the electoral vote, Papandreou's new party however fell short of the 3% electoral threshold. His failure to be reelected marks the first time since 1923 where a representative of the Papandreou political dynasty is not present in the Hellenic Parliament. Following the election he said in a BBC Newsnight interview that his conscience was clear: "I was able to save Greece from default." In March 2017, at the Congress of the Socialist International that took place in Cartagena, Colombia, Papandreou was unanimously re-elected President of the organization. He is also co-chair of the Democratic Alignment, a coalition of the center left parties in Greece, composed by the Panhellenic Socialist Movement (PASOK), the Democratic Left (DIMAR) and the Movement of Democratic Socialists. In May 2017, Papandreou delivered the keynote speech to the European Association of Political Consultants (EAPC) in Brussels. Papandreou and his wife attend the Quadriga Award 2010 ceremony on 3 October 2010 in Berlin. George Papandreou is married to Ada Papapanou and they have a daughter, Margarita-Elena (born 1990). He also has a son, Andreas (born 1982), from a previous civil wedding to Evanthia Zissimides (1976–1987), from Cyprus. He has two younger brothers, Nikos Papandreou and Andreas Papandreou, and two younger sisters, Sophia Papandreou and Emilia Nyblom. Apart from Greek and English, he is also fluent in Swedish. One of his paternal great-grandfathers was of Polish descent. In 2016, Papandreou co-signed a letter to Ban Ki-Moon calling for a more humane drug policy, along with people like Glenn Greenwald, Olusegun Obasanjo and Anthony Romero. 1988: " Botsis's Foundation for the Promotion of Journalism " award for "his multifaceted struggles, which established the Free Radio as part of our democratic institutions"
1997: Abdi Ipekci special award for Peace and Friendship ( June 1997) "for his activities in favor of Greek-Turkish approach during the period 1995–1996 while serving as Minister of National Education and Religion"
^ "George Jeffrey Papandreou - Minnesota Birth Index". FamilySearch. Retrieved 25 June 2016. ^ "George A. Papandreou Personal Site". Papandreou. Retrieved 4 November 2011. ^ "Government of Greece via Internet Archive". Prime Ministry. Archived from the original on 6 June 2011. Retrieved 11 November 2011. ^ "Official curriculum-vitae of George A. Papandreou from the Greek Government website via Internet Archive". Prime Ministry. Archived from the original on 10 November 2011. Retrieved 11 November 2011. ^ Humphreys, Adrian (2 November 2011). 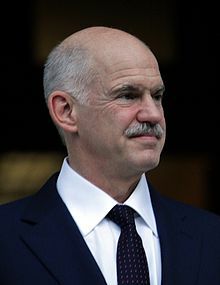 "Greek Prime Minister George Papandreou's surprise connection to Canada". National Post. Retrieved 10 January 2017. ^ "Profile: George Papandreou". BBC News. 6 November 2011. Retrieved 10 January 2017. ^ "As good as it gets". ekathimerini. 4 December 2009. Retrieved 8 December 2009. ^ "World: Europe EU warms towards Turkey". BBC News. 13 September 1999. Retrieved 23 February 2015. ^ "EV50: Europeans of the Year 2003". European Voice. Retrieved 3 December 2011. ^ "EV award winners: Europeans of the Year 2003". EuropeanVoice. Retrieved 3 December 2011. ^ "Papandreou sworn in as Greek PM". BBC News. 6 October 2009. Retrieved 6 October 2009. ^ "Greece Bailout: France, Germany Angry Over Rescue". Time Magazine. 16 February 2010. Retrieved 17 February 2010. ^ "Greece's unemployment rate hits 10%". BBC News. 11 February 2010. Retrieved 17 February 2010. ^ "Greece's Debt and Economy Woes: As Bad as Dubai's?". Time Magazine. 9 December 2009. Retrieved 17 February 2010. ^ "Greece unveils austerity programme to cut deficit". BBC News. 3 February 2010. Retrieved 17 February 2010. ^ "Greek Tragedy: Athens' Financial Woes". Time Magazine. 15 February 2010. Retrieved 17 February 2010. ^ "No tax please, we're Greek". BBC News. 11 February 2010. Retrieved 17 February 2010. ^ "Greece hit by nationwide strike over austerity measures". BBC News. 10 February 2010. Retrieved 17 February 2010. ^ "Greece told to make more spending cuts". BBC News. 16 February 2010. Retrieved 17 February 2010. ^ "George A. Papandreou: Personal Site". Papandreou. Retrieved 6 November 2011. ^ "Transcript of a Press Conference by George Papaconstantinou, Finance Minister of Greece". IMF. 25 April 2010. Retrieved 6 November 2011. ^ "Statement by IMF Managing Director Dominique Strauss-Kahn on Greece". IMF. 23 April 2010. Retrieved 6 November 2011. ^ "wrath of the People". Mike Kamateros. ^ "Μνημόνιο ένα χρόνο μετά: Αποδοκιμασία, αγανάκτηση, απαξίωση, ανασφάλεια (One Year after the Memorandum: Disapproval, Anger, Disdain, Insecurity)". skai. 18 May 2011. Retrieved 18 May 2011. ^ "Inside the Greek parliament protest camp". BBC. 24 June 2011. Retrieved 24 June 2011. ^ "Greece austerity: PM Papandreou tries to persuade MPs". BBC. 22 June 2011. Retrieved 24 June 2011. ^ "EU leaders urge Greek politicians to support new cuts". BBC. 24 June 2011. Retrieved 24 June 2011. ^ "Αγανακτισμένοι": Πρωτοφανής συμμετοχή σε Αθήνα και άλλες πόλεις (in Greek). skai. 5 June 2011. Retrieved 24 June 2011. ^ "Greek government survives confidence vote". BBC. 21 June 2011. Retrieved 21 June 2011. ^ "Βουλευτές – Ανά Κοινοβουλευτική Ομάδα" [MPs – By Parliamentary Group]. Hellenic Parliament. Retrieved 25 August 2011. ^ "Greek crisis: PM George Papandreou cancels US visit". BBC News. 18 September 2011. Retrieved 17 September 2011. ^ a b c d e "Πολιτικό Βαρόμετρο 95 – Οκτώβριος 2011" (PDF). Skai. October 2011. Retrieved 7 October 2011. ^ Gow, David (27 October 2011). "Eurozone crisis: banks agree 50% reduction on Greece's debt". The Guardian. London. Retrieved 11 November 2011. ^ "Greek protesters call president "traitor," halt parade". The Guardian. 28 October 2011. Retrieved 11 November 2011. ^ "Ρίσκα και αβεβαιότητες από την πολιτική "βόμβα" για δημοψήφισμα" [Risks and uncertainties by the political "bomb" for a referendum]. Skai TV. Retrieved 31 October 2011. ^ "Ευ. Βενιζέλος: Από το νέο έτος το δημοψήφισμα" [Evangelos Venizelos: Referendum to take place after the new year]. Skai TV. Retrieved 31 October 2011. ^ "How the Euro Was Saved". The Financial Times Ltd. 11 May 2014. Retrieved 11 April 2015. ^ Kington, Tom; Smith, Helena (6 November 2011). "Papandreou out as Greek leaders agree unity government deal". The Guardian. London. Retrieved 6 November 2011. ^ "Greek PM George Papandreou resigns; polls set for February". Business Today. Retrieved 7 November 2011. ^ "Political opposition divided over unity government". e.kathemerini. 7 November 2011. Retrieved 11 November 2011. ^ "Lucas Papademos named as new Greek prime minister". BBC News. 10 November 2011. Retrieved 10 November 2011. ^ "George Papandreou resigns as Greece's prime minister". The Telegraph. London. 9 November 2011. Retrieved 11 November 2011. ^ "New Greek govt takes over, former banker at helm". Associated Press. 11 November 2011. Retrieved 11 November 2011. ^ "XXIV Congress of the Socialist International, Cape Town". Socialist International. Retrieved 2 September 2012. ^ a b Stamouli, Nektaria (2 January 2015). "Papandreou's Return to Greek Politics Adds New Wild Card to Election". Wall Street Journal. Retrieved 3 January 2015. ^ Papandreou, George (25 January 2015). "A Note on Greek Elections and Our New Movement (KINIMA)". Retrieved 10 February 2015. ^ Chrysopoulos, Philip (26 January 2015). "Papandreou Name Out of Parliament After 92 Years" (in Greek). Greek Reporter. Retrieved 10 February 2015. ^ "Ex Greek PM tells Newsnight: 'My conscience is clear'". BBC News. 28 January 2015. Retrieved 10 February 2015. ^ "Former Greek PM Papandreou Joins Democratic Alignment". Greek Reporter. Retrieved 8 June 2017. ^ "EAPC Brussels speakers". EAPC. Retrieved 8 June 2017. ^ "Pro Brussels Influence: Helping the pols". politico.eu. Retrieved 8 June 2017. ^ "/ George A. Papandreou: Personal Site". Papandreou. Retrieved 4 November 2011. ^ "Hon är Papandreous okända svenska syster (She is Papandreou's unknown Swedish sister)". Expressen. 26 September 2011. Retrieved 6 November 2011. ^ "PM`s George Papandreou visit to Poland". Embassy of Greece in Poland Press and Communication Office. Retrieved 14 November 2011. Wikimedia Commons has media related to George Papandreou. This page was last edited on 24 March 2019, at 04:56 (UTC).